Can you believe we are just about half way through June? That means it is time to think about summer learning loss. One thing we do with our kids is have them read each day. They have a set amount of time and they have to complete this task before they get to do anything electronic for the day. I have an adorable Level 3 reader to share with you today. Sparky and Tidbit by Kathryn O. Galbraith. Level 3 simply means that the story has challenging vocabulary and a longer more complex story plot. Perfect for kids ready to dive into chapter books. SPARKY AND TIDBIT is the story of Sparky, a dog just itching to be a hero. He tries to scare away bone robbers or chase off mean hissy cats, but there are no robbers or mean kitties to be found. Then Sparky bumps into Tidbit, a neighborhood pup with a problem -- he's not as good at reading as the other pups in his class. But when he reads to Sparky, he's no longer embarrassed when he sounds out the words. Soon Ms. Beagle makes Sparky the Official Listener at Little Pooch Puppy School and all the pups practice reading to him. Sparky is a hero after all! SPARKY AND TIDBIT was inspired by the many great reading programs that include dogs as patient listeners. It's perfect for encouraging confidence in young readers. This was a sweet book about a dog helping his fellow dog friend learn to read. Can't get any cuter than that! My middle son was always a big fan of dogs - and would have loved this book when he was ready to read on his own. The book contains 40 pages broken up into 6 chapters. While my little one isn't ready to read on this level he is content to sit for a chapter so that is how I read it to him. Perfect bite sized pieces for reading time. 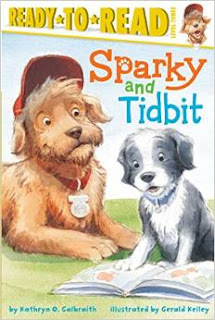 You can purchase your copy of Sparky and Tidbit at your local book retailer or at online stores like Amazon! One lucky reader will win their own copy of Sparky and Tidbit! Oops, that should say, "anyone." Dear Lisa, Your review made my day! I'm glad you enjoyed Sparky & Tidbit's story. It was so much fun to write. I'm now working on ideas for book #2. I would try to let my kindergartner read it to me! I would give this book to my niece, who is a beginning reader! I would read this book to my son!